guuuuyyyysss, this is my last release post for sweet stamp shop! 😦 my 3 month term is over at the end of may and i’m kinda sad. as much as i would have loved to stay on, this summer is going to be super crazy-insane busy in the gray household so i need to put all of my extra energy into making sure this ship runs smoothly. so with that, i give you my final release post (and my second to last post). you can bet i will still be featuring and promoting sweet stamp shop, because seriously, they keep cranking out superb designs. like for reals. this bonus release includes two pretty simple sets, but boy will they be useful for soooo many layouts! introducing balloons and happy birthday!! the release of these was perfect timing because i was just at the point in my project life where we celebrated my mother in law’s birthday. so inspiration wasn’t hard to come by. here is the full spread i made for the day. the title card was so much fun. for the balloons, i stamped onto scraps of patterned paper and then cut around them. i used pop dots on the back of the yellow and green ones to give them some dimension. then i just stamped the strings directly on the paper. the happy and birthday are stamped directly on a trimmed 3×4 card. easy as pie…or cake! my mother in law is a beach lover. she loves tropical places and decorates her house with palm trees and lush colors that remind her of the places she loves. so when it came to making a card for this layout, i wanted to represent and celebrate her. now let’s get one thing out there, i am no painter. i have never found a deep love for this particular medium. my mom however, she’s a fabulous painter! and when she told me she was taking a watercolor class i was so excited because my interest in watercolors had been sparked recently. she and i had a crafty day last weekend and i wanted her to help me practice and show me some techniques after some failed attempts to mix stamps and watercolors during the previous week. we are seriously the best team. whatever project we do, we always take on our respective roles. i come up with the design and she helps execute it. 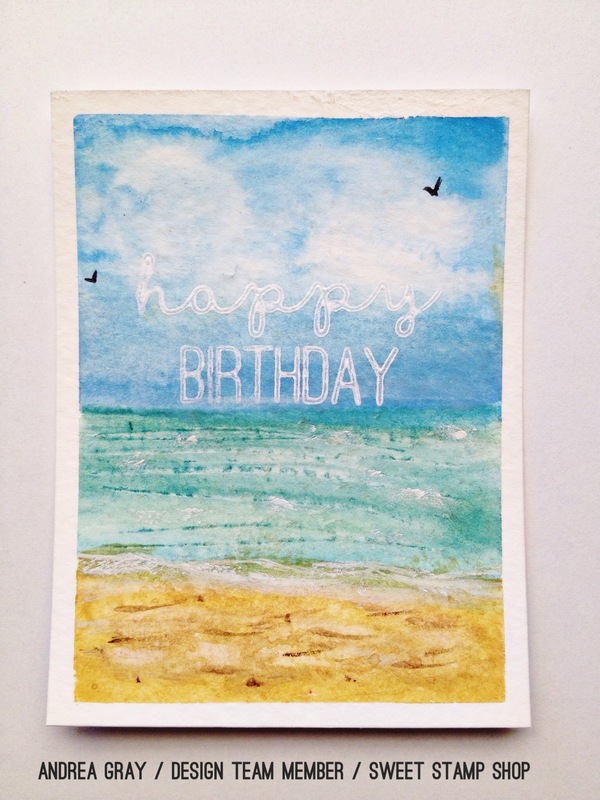 i knew i wanted a beach scene with a happy birthday sentiment in the sky and i had the color samples i wanted. so she helped me mix colors and showed me techniques to get the results you see here. i did one, loved how it turned out so i did another! gorgeous isn’t it? any chance i can be teleported here? and as a special bonus, i filmed the process of me making the second one and i’d love to share it with you. BUT WAIT! there’s more! how would you love a giveaway? 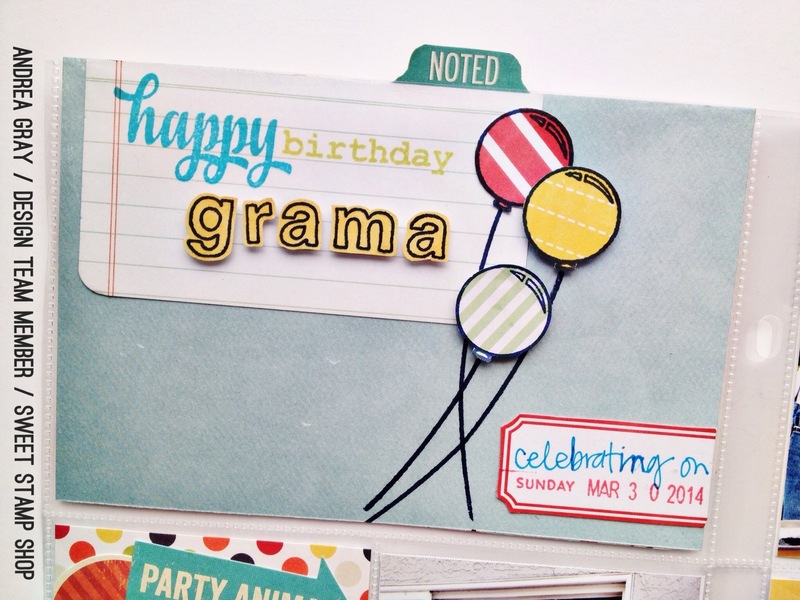 head over to the sweet stamp shop blog to enter to win some oldie but goodie sets! i sure hope you have some crafty weekend plans! Such AWESOME goodness…way to rock the Sweets! I loved working with you! 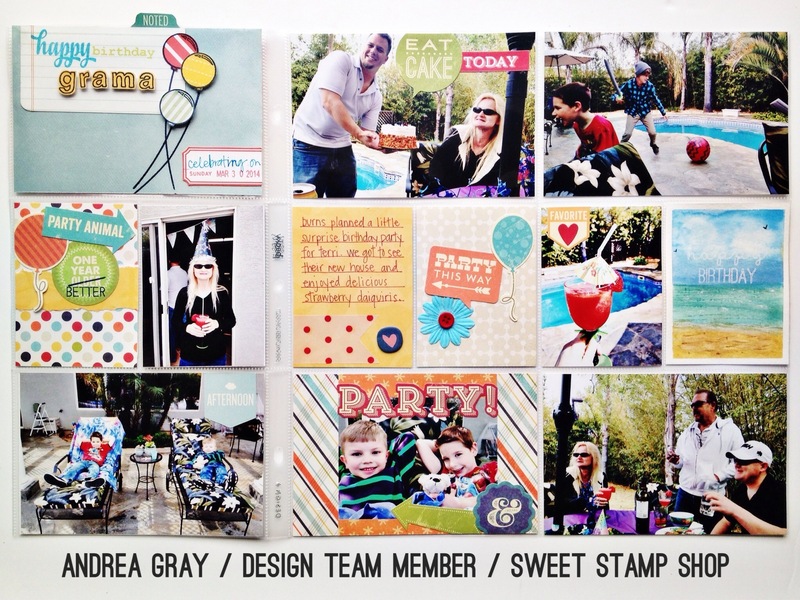 I hope to jump on the whole pocket scrapbooking wagon…soon.